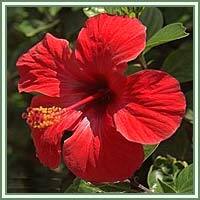 Habitat: Hibiscus is native to the tropical and subtropical regions of the world. Grows in wet and swampy areas. 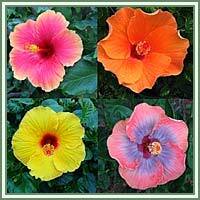 Description: Hibiscus is an n evergreen, herbaceous plant. It has ornamental, large, dark-red flowers. They are firm, trumpet-shaped and odorless, with single and double set of petals. Medicinal use: Hibiscus flowers, roots and leaves, are anodyne and emmenagogue. They regulate menstruation and stimulate blood circulation. Flower extract has been traditionally used for liver disorders, high blood pressure and as an aphrodisiac. Young leaves and flowers are used in case of headache. Decoction of leaves, root and fruits are helpful in treatments of arthritis, boils and coughs, and the fruit is used externally in cases of sprains, wounds and ulcers. Hibiscus tea is rich in Vitamin C.